In New Jersey, county CTE schools have changed, say education leaders. 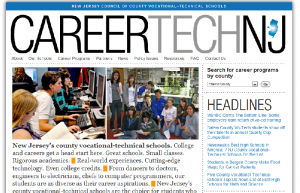 Hence, their Â Web site also has changed to reflect the new growth and success of CTE in New Jersey. New Jerseyâ€™s 21 county vocational-technical schools districts sent 70 percent of 2010 graduates on to college or post-secondary training. The Web site provides information about all of the stateâ€™s CTE schools, the career programs, business and academic partners, and features videos, blogs, and timely news. This entry was posted on Friday, March 2nd, 2012 at 2:26 pm	and is filed under News. You can follow any responses to this entry through the RSS 2.0 feed. Both comments and pings are currently closed.